Your most recent vacation has brought you to the Jonesboro Grand Hotel, a home away from home with all the most modern amenities! Amongst all the glitz and glamour there also hides a dark secret, Room 555. Hotel management has stressed that no guest is to enter this mysterious room, but won’t explain why! Your group of friends decide to find out what’s up with the seemingly banal room and have just broken in when the door slams shut behind you and locks tight! With seemingly no way out, you explore your surroundings to attempt to escape before you become part of the mystery yourself! 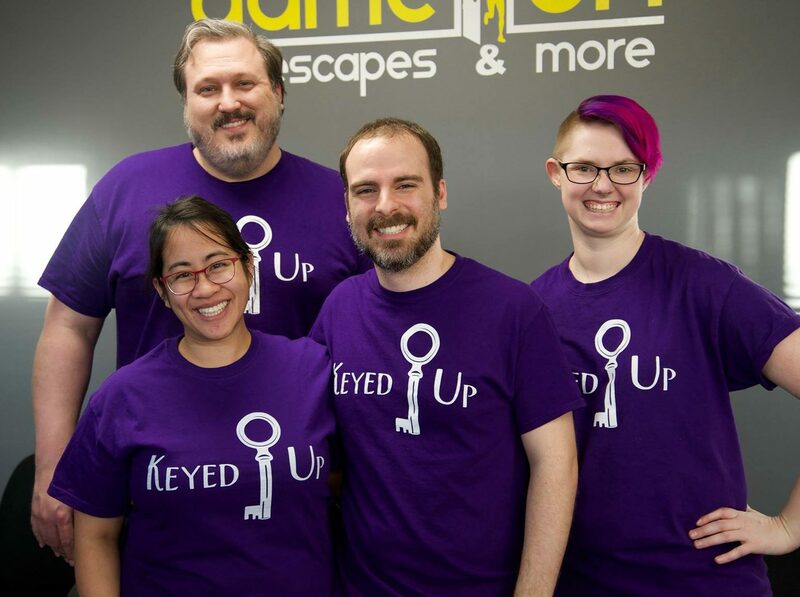 During our previous trips to Time’s Up for The Millionaire Murder Escape and The Bank Vault Escape we were left somewhat underwhelmed with the experience. We’d heard, however, that after relocating and developing some new rooms, Time’s Up had created much better experiences. We were glad to hear it since the staff and owner seemed to really want to create top notch adventures, and it just so happened that I had a few free tickets lying around for a risk free look at one of their newest games! The new space is well laid out and includes a photo booth for after game pictures. After an enthusiastic greeting from Time’s Up’s owner and her staff we were ready to begin our game! After entering the room, it was obvious that a lot of care had been taken to make the set really immersive! The hotel room was excellently laid out with spooky dressings and several accouterments one would expect to see in an abandoned old room. The lighting was just dim enough to set the mood while still allowing for everyone to see properly. There was indeed a black light but it was luckily not abused, and a quick sweep allowed us to find the clues we needed to in a non-frustrating manner. The room was set up in such a way as to provide a linear game flow but still entertain the whole group, keeping us puzzling for a full round of enigmas. Some late game surprises were simple yet extremely well hidden and kept our group of seasoned veterans on our toes! It’s always an awesome experience when a room is able to keep a secret or two hidden from us until the exact right moment. Though there were several basic locks around the room, there were quite a few technological interactions that we really enjoyed. Tech was seamlessly integrated into the room and furthered the story with small clues and bits of info that added to the experience well. The escape itself felt climactic and we enjoyed talking to the staff afterwards about our experience and their newest room, The Jungle! The opening rules rundown is fairly long, and could use some tightening, as it was really hard for me to stay focused on it instead of beginning to wander around the room. At one point we needed a clue, but due to a freak technical problem the camera had unfortunately gone out in our room. This led to the Game Master entering, breaking the immersion somewhat, and since she wasn’t able to see where we were in the game it took her a little more time than usual to formulate a hint for us. This was handled as well as possible for the situation however, and wasn’t that big a deal. One particular puzzle involves a pretty large leap of logic and though we were able to figure it out quickly, the connective tissue is very light and could benefit from some bolstering to keep it from feeling so random. Some of the props within the room still have price marks or barcodes stuck to them, which feel highly off theme within this rundown old hotel room. We’re really excited to see that Time’s Up have upped their game, puzzle and technology wise, and thought that Room 555 was a lot of fun. We’re glad to see that their determination to improve has paid off and can’t wait to see what’s in store with their new Jungle room. You can check in to Room 555 here!